AMD claims the fastest will outpace Nvidia’s current Titan X Pascal card. 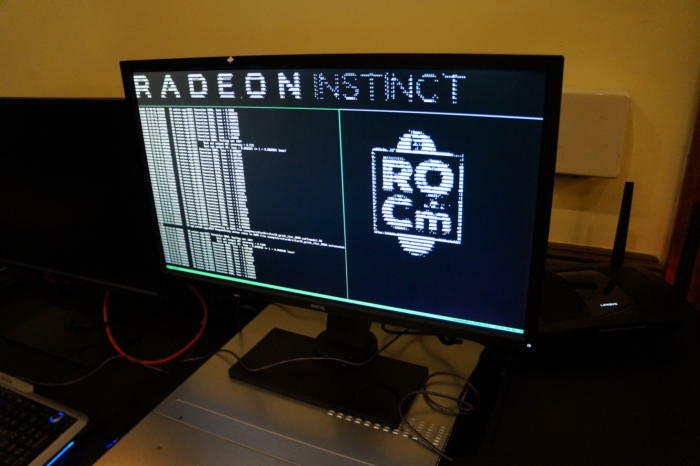 With the Radeon Instinct line, AMD joins Nvidia and Intel in the race to put its chips into AI applications—specifically, machine learning for everything from self-driving cars to art. The company plans to launch three products under the new brand in 2017, which include chips from all three of its GPU families. The passively cooled Radeon Instinct MI6 will be based on the company’s Polaris architecture. It will offer 5.7 teraflops of performance and 224GBps of memory bandwidth, and will consume up to 150 watts of power. 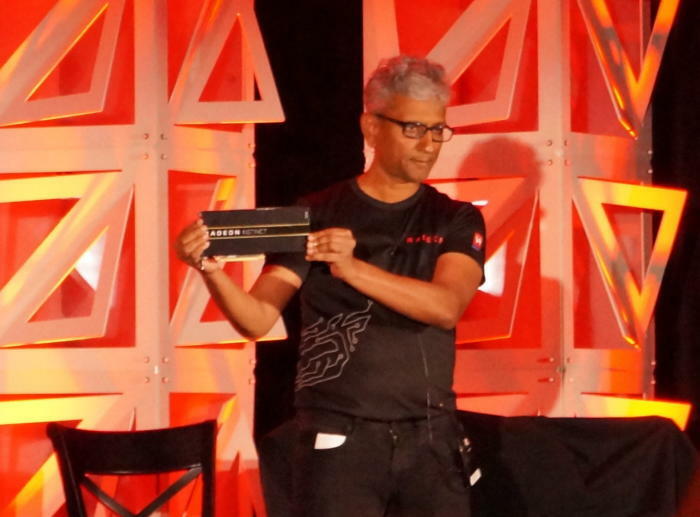 Radeon head Raja Koduri holding a new Radeon Instinct MI6 accelerator. The small-form-factor, Fiji-based Radeon Instinct MI8 will provide 8.2 teraflops of performance and 512GBps of memory bandwidth, and will consume up to 175 watts of power. The third GPU, which will be based on AMD’s upcoming Vega architecture, will be called the MI25 Vega with NC. This chip will be passively cooled, will consume up to 300 watts of power, and will feature a new high-bandwidth cache and controller. AMD claims its top Radeon Instinct GPU already outperforms Nvidia’s Titan X and Titan X Pascal cards. AMD didn’t release any teraflop rating for the MI25, but the company claimed the performance of its top Radeon Instinct GPU beats Nvidia’s best offering. If the MI6 is 5.7 teraflops and the MI8 is 8.2 teraflops, the MI25’s name hints that the card might be 25 teraflops. That would beat Nvidia’s current Titan X Pascal card, which is rated at 11 teraflops. Why this matters: Machine learning or machine intelligence, which can train computers to drive, paint, talk and more, is part of the burgeoning market for artificial intelligence . Companies like Google, Nvidia, and Intel have made major investments in AI-focused hardware. Radeon Instinct is AMD’s bid to get a piece of the action. 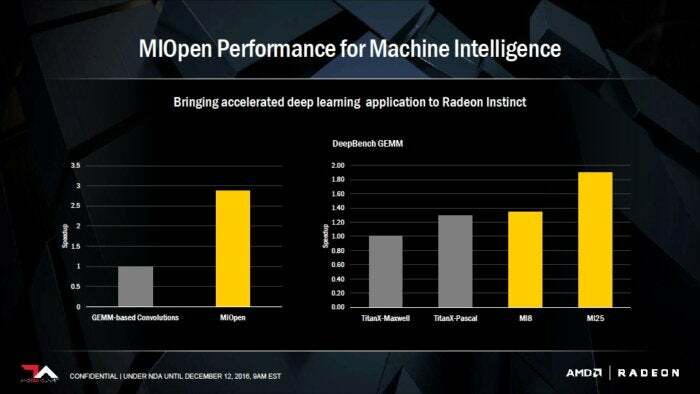 Besides the Radeon Instinct cards, AMD also said it will release its ROCm deep-learning framework, as well as an open-source GPU-accelerated library called MIOpen. The three cards and well as ROCm and MIOpen are expected to be released in the first half of 2017. The question is whether cash-poor AMD can elbow its way into this hot market. Nvidia has a head start, with a few generations's worth of products already in play. Google showed off its Tensor Processing Unit in May, and Intel just spent $400 million in August to buy deep-learning startup Nervana. The next step, Moorhead added, is for AMD to prove its Radeon Instinct products can live up to the promises. 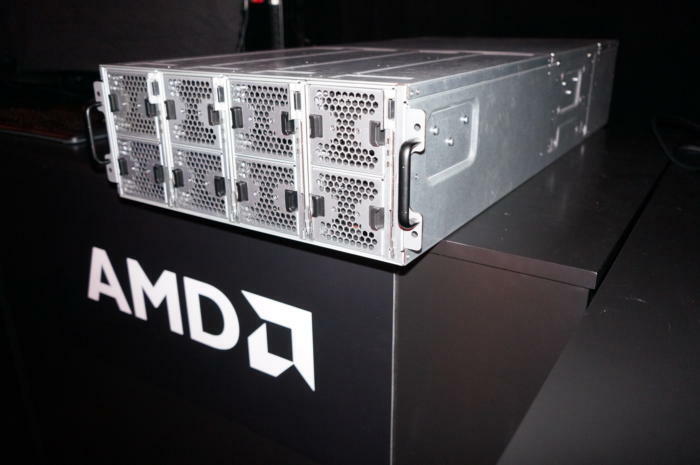 “AMD needs to disclose more details on its Instinct cards running [deep neural network] workloads," he said.